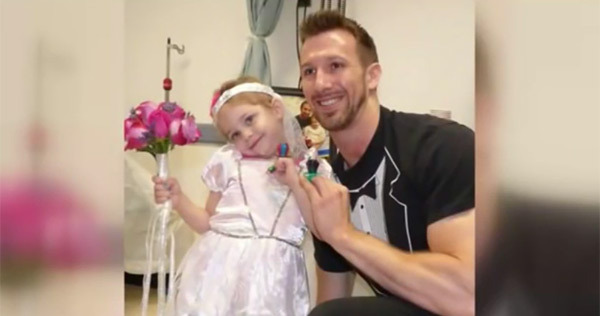 One of the trending topics online today is about a 4-year-old girl who married a nurse 25 years her senior. Watch the video to understand why. Abby Sayles has been battling Pre-B Cell Acute Lymphoblastic Leukemia since last year. While receiving treatment at the Melodies Center for Childhood Cancers at Albany Medical Center, she developed closeness with Matt Hickling, one of her nurses. News10.com reporter Anya Tucker said Abby wanted to seal that relationship so she proposed marriage to her knight in shining armor. He agreed. The simple "wedding" was held after the girl popped the question. Hickling's colleagues bought flowers and hummed "Here Comes the Bride" during the ceremony because no musical instrument was available at the time. In an interview, Abby shared that she felt good about being married. Her mom, Renee, said the happiness felt by her daughter means the world to her and the whole family. She said Abby's prognosis appears pretty good, adding that she hopes the "event" would serve as a bright spot of her memories as she undergoes chemotherapy.